In December 2016, Free to Run started a very unique project in Afghanistan. 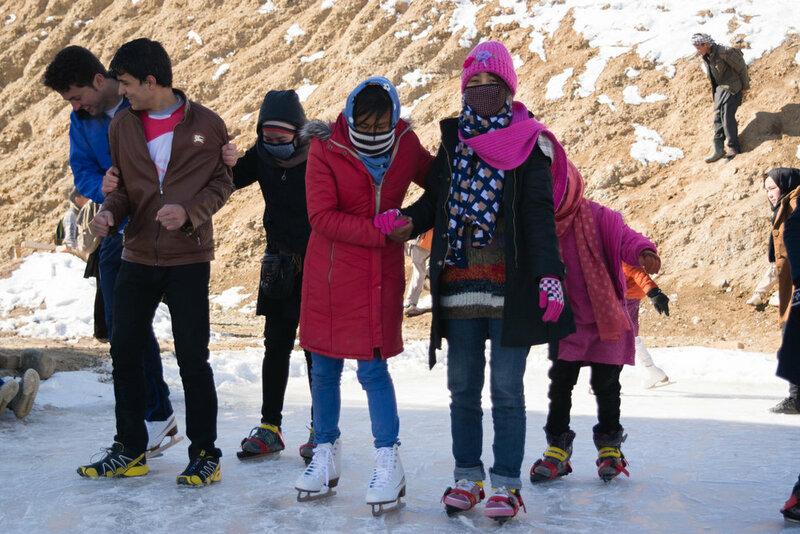 In partnership with the Canadian Embassy in Afghanistan and the Conservation Organisation for Afghan Mountain Areas (COAM), we facilitated the construction of the new ice skating rink, the very first one in all of Afghanistan. We flew the international ice skating coach, Britt Das, into the country for a few weeks in February so some of our Afghan participants could experience the joys of ice skating combined with important environmental training sessions. The project was aimed at young women (ages 10-25) from the region, but participants from other regions were also flown in to take part in a special Winter Sports Week. The program incorporated environmental lessons such as greenhouse planting and compost training. Why skating and the environment? Of course all winter sports are connected to the environment and climate. At the same time, the program was designed to reach a more diverse group of girls who might be interested in sports or the environment, and have them experience both. Before receiving ice skating instructions, the students attended at least one environmental training session. Using this approach, Free to Run and COAM delivered ice skating and environmental training to over 70 young women, in just one month. "I had a great two weeks and I will miss the girls dearly,” said skating instructor Britt Das. “The beginners were already skating like they had been doing it for weeks. They were helping each other, giving tips and holding hands. Lots of laughter and an occasional fall gave me a feeling of joy and happiness. This scene could have been anywhere." Our thanks to the Canadian Embassy in Afghanistan and the Conservation Organisation for Afghan Mountain Areas (COAM) for supporting this ground-breaking project.